Italian dressing is a combination of dried herbs with a zesty vinegar. This dressing can be made ahead and stored in the refrigerated and use when required. It can be served in pastas and salads. This salad is a crunchy, sweet and tangy mixes with fruits and veggies. Homemade dressings are always healthy, fresh and can be customised as per the taste. So try this Italian dressing in any salads of your choice. 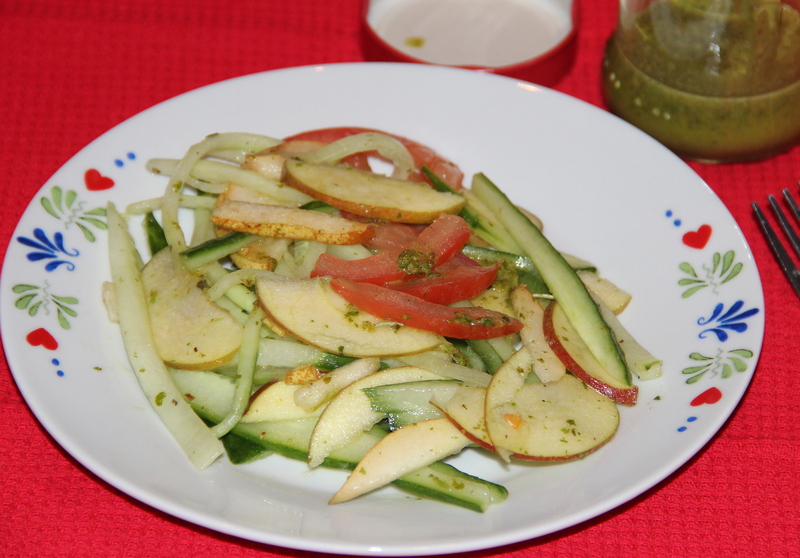 Place sliced cucumber, apple, pear, tomato in a bowl and to this drizzle some dressing give it a toss and enjoy. Posted on September 27, 2014, in Dips, Dips, Indian, International. Bookmark the permalink. 21 Comments. always my pleasure, have a wonderful weekend. I love this–it sounds so good and simple to make! I love making my own salad dressing – you know the ingredients and it is so much better than store bought!